When it comes to food, we might not know how to create something authentic in the kitchen, but we certainly know what the real thing tastes like, whether it’s a tomato from the garden, genuine ethnic cuisine, or good home cooking. It doesn’t have to be fancy: a slice of good bread is true nourishment. Deciding what’s “authentic,” “the real stuff,” “the truth,” in jazz or any other art form can be exhausting, sure to create debate among the faithful. But most of us would agree that we admire musicians who not only know their instruments superbly, but can make music that is both deep and intuitive — playing from the heart, evoking joy, sorrow, creating melodies while keeping the rhythm moving. We want to remember the music once the applause has died down, once the disc has faded into silence. 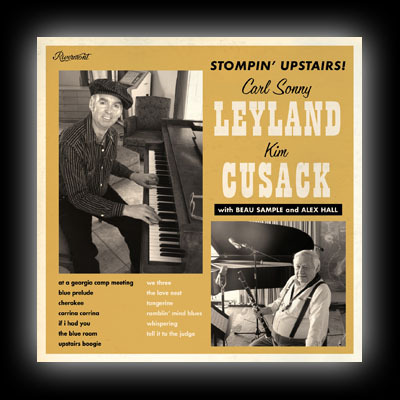 Pianist / singer / composer Carl Sonny Leyland and reed master Kim Cusack are authentic through and through. Their music comes from deep experience and deep feeling: it conveys the wonderful balance of exuberance or grief and the craft to express it fully and convey it whole to us. Thanks to Bryan Wright’s Rivermont Records, we can experience their casual assurance first-hand in a new quartet recording, STOMPIN’ UPSTAIRS, where they are given the best support from bassist Beau Sample and drummer Alex Hall — names familiar to anyone who’s delighted in the Fat Babies. Some compact discs charm us initially but pall after a few songs. Not this one. It’s a series of delights — the songs take us to different places without administering violent shocks, and the sound is reassuringly natural. The songs are AT A GEORGIA CAMP MEETING / BLUE PRELUDE* / CHEROKEE / CORRINE CORRINA* / IF I HAD YOU / THE BLUE ROOM / UPSTAIRS BOOGIE / WE THREE* / THE LOVE NEST / TANGERINE / RAMBLIN’ MIND BLUES / WHISPERING / TELL IT TO THE JUDGE. Starting from the back, the rhythm playing couldn’t be better: the right notes, the best harmonies, a light yet powerful beat. Beau and Alex don’t use or need attention-getting tricks: they play for the band in the most reassuring, uplifting ways. I have heard Kim on clarinet (in person) for the past few years, and admire his playing greatly: a sweet-tart evocation of people like Darnell Howard — with no affectations, no showing-off, just heart, intelligence, wit, and power. But I hadn’t ever heard Kim play alto saxophone before, and on this often-abused instrument he is a little-celebrated master: you’ll have to hear him to know what I mean. And Mister Leyland. I’ve had the privilege of learning from him at every performance, taking lessons in creativity, intensity, relaxation, and joy. But I fear that some casual listeners have already decided the little boxes he fits in to: “boogie-woogie pianist” and “blues singer.” Yes, but no. Carl Sonny Leyland is a great improvising jazz artist and a wonderfully moving singer: hear his WE THREE and BLUE PRELUDE to understand that he is delivering the best messages straight to our hearts. The band — as a quartet — knows how to do the cakewalk, how to rock that thing, how to swing their upstairs room so that the house is swaying, how to feel a ballad, how to have a good time. STOMPIN’ UPSTAIRS is a small flat package of infinitely expandable pleasure — with two extra added attractions. One, perhaps only record collectors will appreciate — but the format of the back cover is a hilariously exact homage to a Columbia Records design circa 1954. You’ll know it when you see it. And the liner notes, written by Mister Leyland, are just like him: wry, perceptive, funny, never pretentious. I have a wall of compact discs and more music than I can possibly ever listen to again, but I’ve been playing STOMPIN’ UPSTAIRS regularly and frequently.